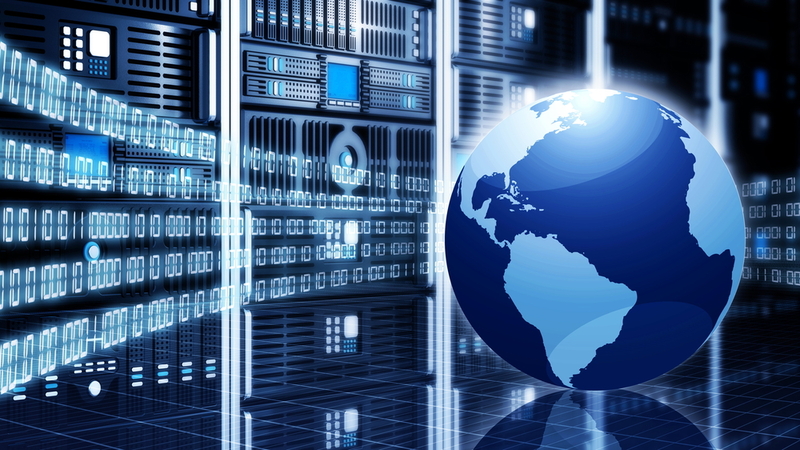 The Safe Harbour Framework was a cross border transfer mechanism which complied with EU data protection laws and allowed the transfer of personal data between the EU and the USA. More details on how Safe Harbour worked can be found here. Why was the Safe Harbour Framework invalidated? After the recent Facebook case ruling, on 6th October, the Court of Justice of the European Union (CJEU) judged that “US Companies do not afford an adequate level of protection of personal data” and therefore the Safe Harbour Framework is now invalid. The CJEU indicated that US legislation authorises on a general basis, storage of all personal data of all the persons whose data is transferred from the EU to the U.S. without any differentiation, limitation or exception being made in light of the objectives pursued, and without providing an objective criterion for determining limits to the access and use of this data by public authorities. The CJEU further observed that the Safe Harbour Framework does not provide sufficient legal remedies to allow individuals to access their personal data and to obtain rectification or erasure of such data. This compromises the fundamental right to effective judicial protection, according to the CJEU. You can read the European Court of Justice Press Release here. There have been concerns about the Safe Harbour Framework for some time and the European Commission and the US authorities have been negotiating with a view to introducing an arrangement providing greater protection of privacy to replace the existing agreement. How can I now transfer my data to US? Organisations that have been using Safe Harbour will now have to review how they transfer personal data to the US and come up with alternative solutions. However, it is worth noting that the Information Commissioner’s Office has recognised that this process will take some time. And James Milligan at the DMA states that data already transferred to US-based companies under Safe Harbour will be unaffected. 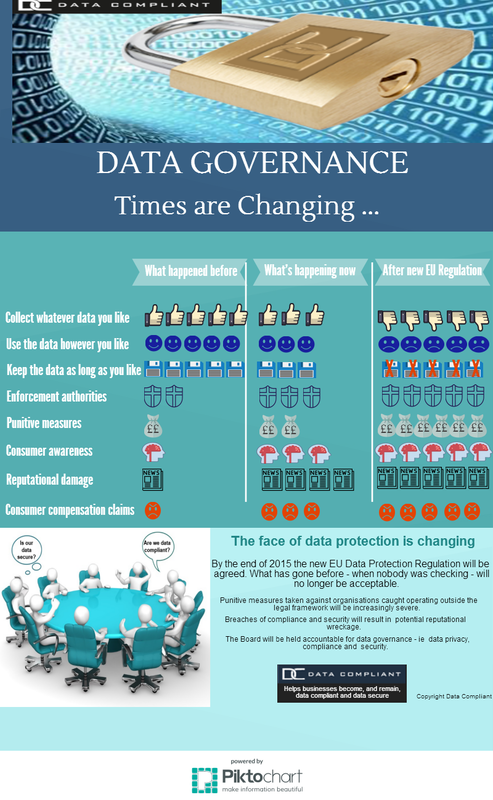 In the meantime multi-national companies transferring data to their affiliates can look at using Binding Corporate Rules which allow the transfer of data from the EEA to be in compliance with the 8th data protection principle. Another legal method of transferring personal data to the US is to use the Model Contract Clauses produced by the EU for transfers of personal information outside the EU. Michelle Evans, Compliance Director at Data Compliant Ltd. This entry was posted in Data Compliance, General Information and tagged data compliance, data privacy, data protection, data transfers, safe harbor on October 9, 2015 by Data Compliant. The ongoing stories in the press are hurting charities who are being seen to be treating decent people – particularly vulnerable people – monstrously unfairly. The press and media are giving consumers an ever clearer perception of the charity sector as being irresponsible, uncaring and aggressive in their treatment of donors. And it does the data industry no favours at all. This entry was posted in Data Compliance, General Information, UK Data News and tagged charities, data compliance, data privacy, data protection, data security, data sharing on September 3, 2015 by Data Compliant. 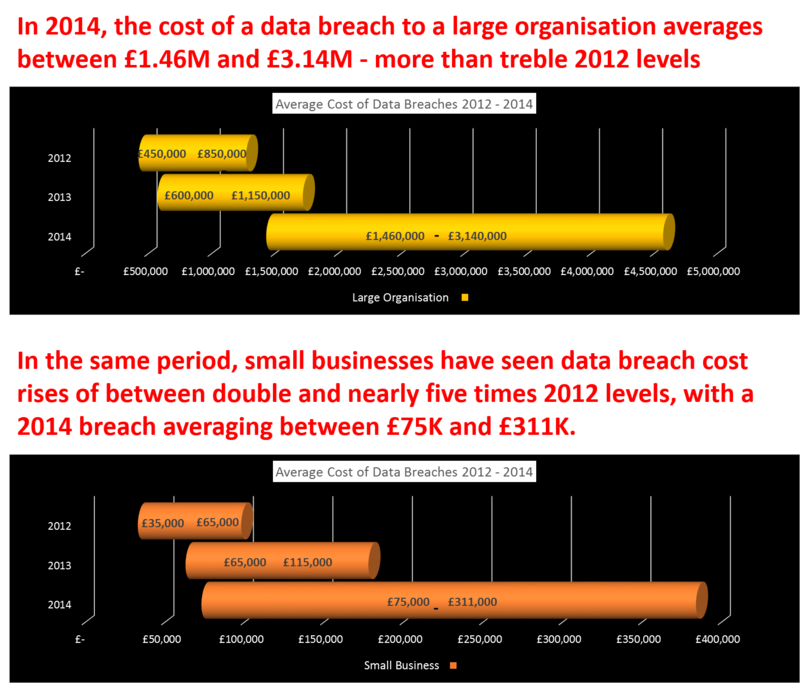 The 2015 UK data breaches report shows significant rises in numbers and costs of data breaches, with growth shown in my previous blog, Data Breaches – OUCH! . The infographic below summarises the key data breach stats from 2014, including a nod to the impact of new technology. This entry was posted in Data Security, General Information, UK Data News and tagged data breach, data privacy, data protection, data security on June 10, 2015 by Data Compliant. Alarming data breach statistics are shown in the latest survey from HM Government*, with costs increasing to prohibitive levels for businesses large and small. This entry was posted in Data Security, General Information and tagged cyber security, data breach, data governance, data privacy, data protection breach, data security, data security breach on June 4, 2015 by Data Compliant.